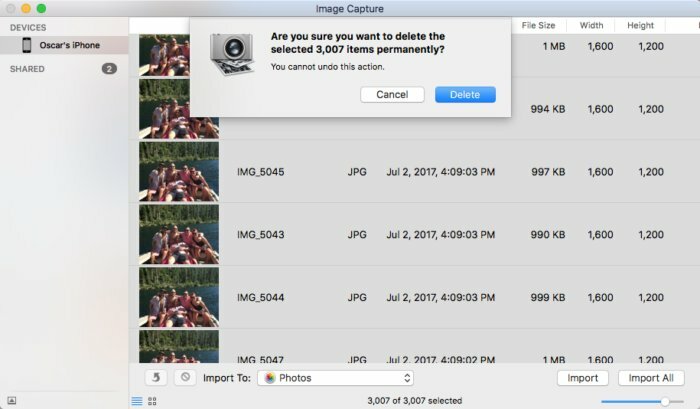 How do I delete photos from my iPhone after importing to my computer? It becomes so disturbing when we are set to delete photos from iPhone after import for recycling, selling, or giving them out to charity, and we get to a touching point that most of our photos are still opened to recovery even after deleting. And with the statistics that shows that "1 out of 14 Americans are victims of identity theft," by US Department of Justice, we become more terrified between the dilemma of holding back to old iPhones or letting them go and be vulnerable. The worry has come to an end and here is a great news for iPhone users, even the iPhone X and iOS 11 users; there is a way out of this mess and it the awesome privacy protector, iMyFone Umate Pro! 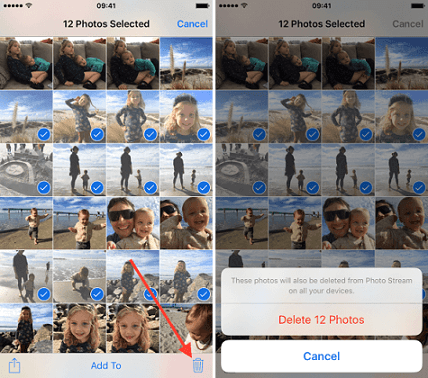 With which, you can permanently delete photos from iPhone after import. There are many lousy apps out there promising to give a delivery of "total erasure of photos" but are either not delivering at all or just deleting from physical folders to hide them as junks somewhere. Fortunately, iMyFone Umate Pro is not here for games, it can completely delete photos from iPhone after import without any slight chance of recovery by any app, agency, even the FBI. It allows you to do a 1-click export & delete photos. It can erase all photos permanently without any chances of recovery. Total erasure is not limited to photos, as it can also permanently erase videos/website data/messages/call history/third-party app, and other private applications. 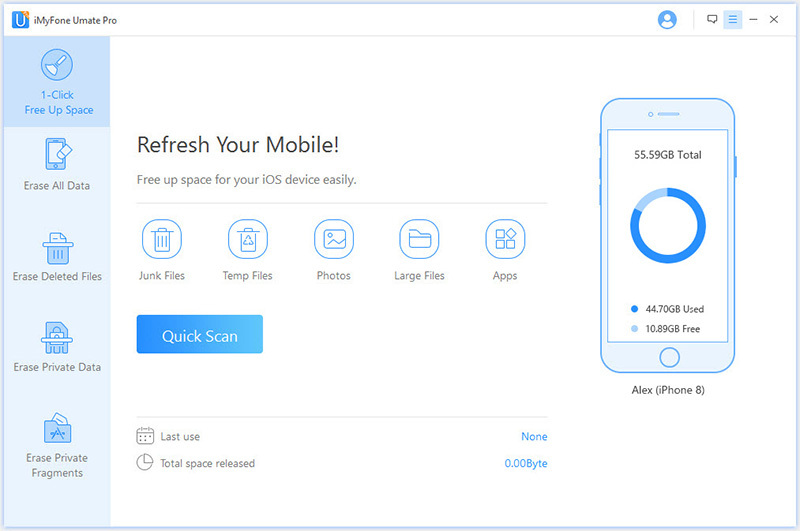 It can also scan and permanently delete files that have been deleted on iPhone. It offers you a guarantee of being the best tool to help you keep your privacy on iPhone intact. At this stage you are expected to delete photos from iPhone after importing to Mac/PC by installing and launching Umate Pro on your PC or Mac. 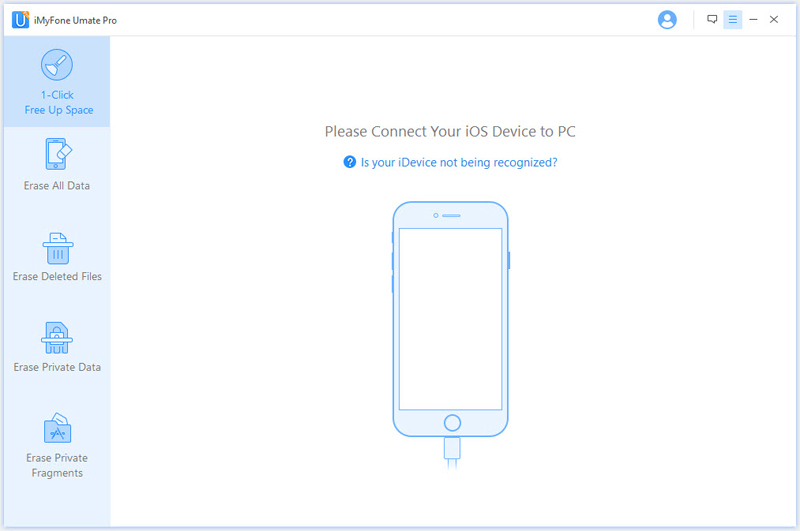 After which, connect your iPhone to your computer by using a compatible USB cable. On the software interface, choose "1-Click Free Up Space" tab where you can click the "Photos" button that would make you run a quick scan of your iPhone. When you are done with scanning, you will see details on how much space can be saved with photos. Click on "Export & Delete" button, this will immediately export your photos to computer and also delete them from your iPhone. Step 1: You will launch the Photos app on your iPhone or iPad, open albums in the bottom right corner. Step 2: Then click on the photo you want to delete, and tap the Trash icon in the right side of your screen and tap the Delete (x) Photos to confirm the photos you want to delete. Step 1: Connect your iPhone to your Mac, then launch Image Capture. Step 2: Press Command+A to do a quick select all on the images. Step 3: Click the red delete icon, and all the photos on your phone will be deleted instantly. 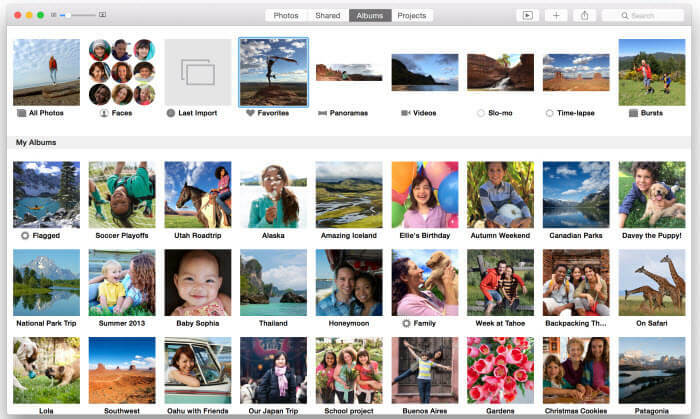 If you feel you still need some photos, make sure you have backups before you use this option or click the "Import All" button to import them to your Mac before the whole deleting process. 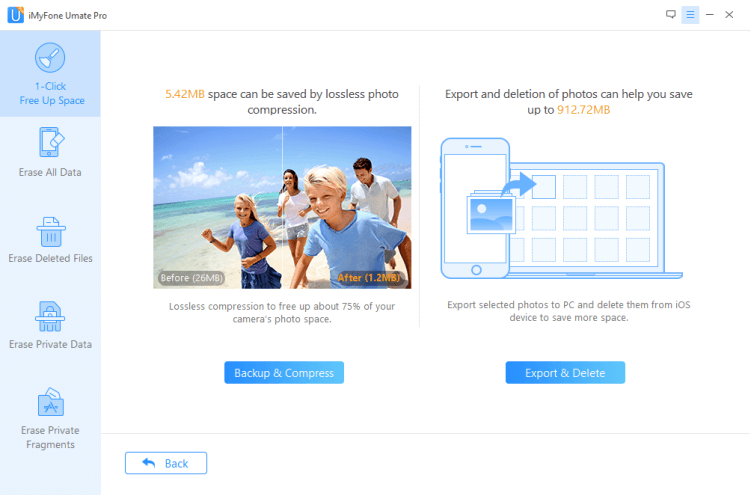 This is another approach to deleting iPhone photos after importing to Mac. Step 1: Connect your iPhone and then launch Photos app on your Mac. Step 2: Choose the photos you want to delete and then press command + delete. 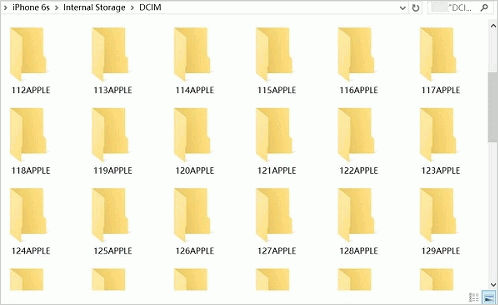 Step 1: Connect your iPhone to the Windows PC, then go to your iPhone’s DCIM folder within the Windows Explorer. Step 2: Select your unwanted photos or you can press Ctrl + A to select all. You can delete them by right-clicking or pressing Shift + Del to delete them from your iPhone. You should know that the above alternative methods have their cons as to their processes. It should be noted that deleted photos with these alternative methods can still be recoverable through the use of recovery programs . It is advisable to go for one-in-all app, the iMyFone Umate Pro and use Erase Deleted Files mode to complete the deleting process.